When it comes to AR pattern rifles, the Hybrid contour design strikes an ideal balance between barrel stiffness and comfortable carry weight. Criterion Barrels has expanded this product line to include models popular with shooters in various rifle disciplines, including personal defense, 3-Gun, and the PRS Gas Gun Series. The most recent additions incorporate two different barrel designs. The 14.5″ configuration (14150-HY8) was introduced as a high performance option for shooters seeking the flexibility offered by barrels in this length. 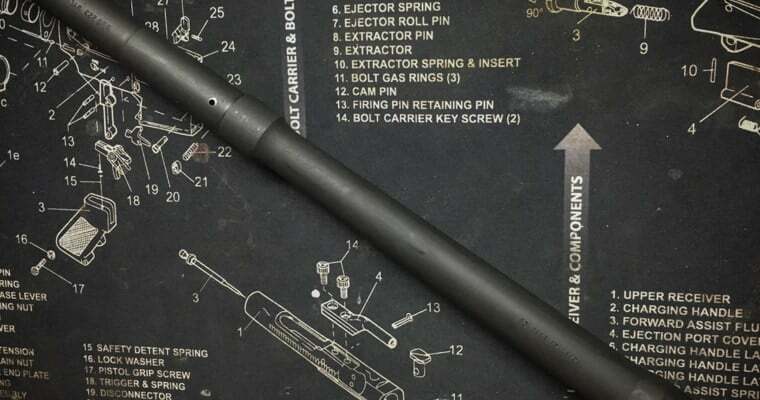 This barrel design may be pinned and welded to meet the 16″ NFA requirement, installed on an AR pistol, or left as-is for shooters looking for an option to be mounted on their NFA compliant short barreled rifles. Utilizing Criterion’s proprietary chrome lining technology these barrels are capable of consistent sub-MOA performance with factory match ammunition, and group sizes in the neighborhood of .5 MOA with handloads tailored to the individual barrel. The mid-length gas system on this barrel configuration offers additional perceived recoil reduction when compared to its carbine length counterparts. MSRP for this barrel model is $289.99. The second model released by Criterion involves a slight variation on an already popular model available through a number of distributors. The new hand lapped 22″ 6.5 Creedmoor barrel model (102265S-HYR-N) incorporates a salt bath nitrided finish for extended barrel life, enhanced corrosion resistance, and limited fouling. Each of these barrels comes standard with a JP Enterprises .308 AR barrel extension, featuring an improved feed ramp angle designed to offer superior bullet alignment and feeding capability with high BC bullets commonly used with rifles of this type. As with all salt bath nitrided barrels produced by Criterion Barrels, each of these barrels comes standard with a polished chamber and rifling to alleviate the need for significant barrel break in. We expect this barrel design to be popular with shooters involved in the PRS gas gun series, and as an upgrade option for law enforcement agencies requiring sub-MOA performance from their DMR type rifle platforms. MSRP for this barrel configuration is $389.99. While the aforementioned barrel models will soon be available through Criterion dealers and distributors, these two new configurations may currently be ordered factory direct. Please contact Michael Ross at (262) 628-8749 with any order inquiries.